Posted on: April 11th, 2019	by Guest Blogger and Jennifer A. In 2018, General Motors completely redesigned the Chevy Traverse and upgraded safety components. As you can imagine, the kinks are worked out in the latest 2019 model. 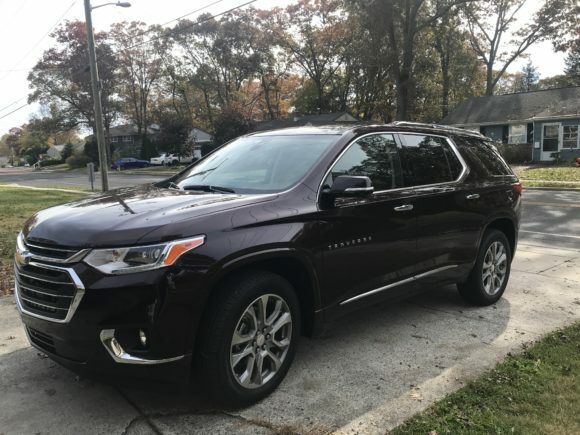 Recently, Jennifer had the opportunity to test drive that car for a week and raved about the incredible Chevy Traverse safety features that she never even knew she wanted, but were now squarely in the need category. When she shared with me, I just knew that I wanted to get them all, plus my classic favorites, into an easy-to-read format for you to consider when you go buy a new car. The 2019 Chevy Traverse safety features are better than ever. Photo Credit Jennifer Auer, Jersey Family Fun. I’m Chaya, the automotive educator and blogger behind Mechanic Shop Femme. My platform is all about things like this – helping women and LGBT folks know more about their cars, and equip them with the information they need before they head to the dealership or mechanic shop. Writing and teaching about cars in easy-to-understand terms is my life’s work! When you are thinking about buying a new car, what’s the first thing that crosses your mind when it comes to requirements? Is safety the priority? Comfort? Space? With the 2019 Chevy Traverse, General Motors did not force you to make a choice. The National Highway Safety Association give this vehicle a 5 star rating in Overall Safety. As this SUV comes standard with three rows of seating, you can expect to find your family comfortable plus lots of cargo room in the trunk. And the safety features? They are top notch. 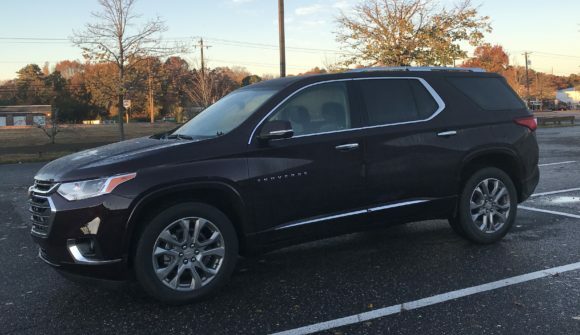 SUVs as a class have a really wide price range, but the 2019 Chevy traverse is one of the best-priced options for the space, seating, and safety features. Starting at just under $30,000 it’s a pretty economical choice. Jenn test drove this 2019 Chevy Traverse. Photo Credit Jennifer Auer, Jersey Family Fun. It’s easy to get lost in the sea of information and safety features listed about this vehicle. I’ll make it easy by highlighting Jennifer’s favorites, then some of my own. One of the first things that Jennifer noticed about the car was the automatic headlights. Now I’m sure you’re thinking, oh my car has those! Here’s the thing – these headlights not only smoothly transition from day to night, they will also automatically adjust your high beams (brights). This means that when the car senses you need them, they will switch on, and when you don’t, they will switch off. Not only that, but when there’s another vehicle driving towards you, the high beams will momentarily shut off to avoid blinding the other drivers! This helps make sure that other drivers don’t lose control of their car during a temporary flash of high beams in their eyes. We’ve all been in a position where we’re temporarily blinded and the awful, unsafe feeling – so it’s an amazingly thoughtful safety feature. 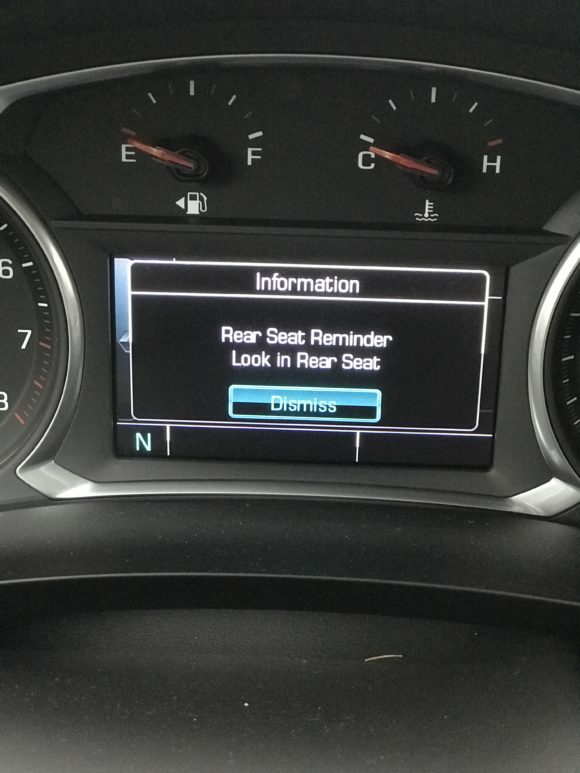 As a person without children, I rarely need to worry about what’s in my back seat, but Jennifer pointed out to me that the 2019 Chevy Traverse actually reminds you to check the back seat after you shut off the car. What a cool feature for a busy, tired parent! Not only does it remind you about any children, but also helps you to not forget about the groceries, purchases, or other odds and ends you throw into the back seat. I live in Wisconsin, so you could easily guess that getting around easily and safely in the snow is a priority for me. While the 2019 Chevy Traverse doesn’t come with the All Wheel Drive option on all submodels, I love that it is available for those of us that need it. The downside to all wheel drive is that since it makes the car heavier, it does slightly lower the fuel usage. 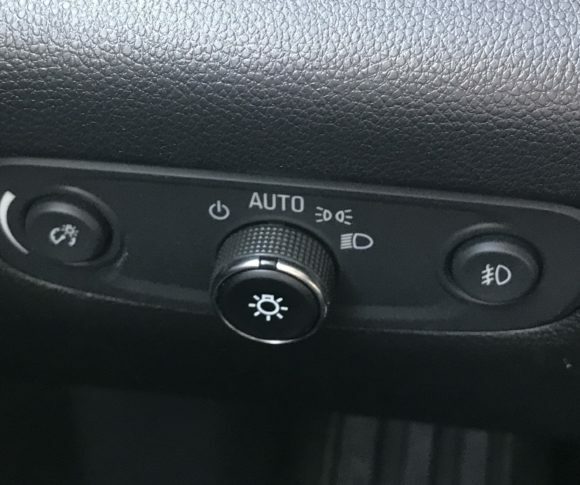 This safety feature does come at a higher price since it’s not available on the base model, but is easily worth it for those of us in colder climates. While not all safety features are high tech, some of the most powerful ones definitely are. The 2019 Chevy Traverse comes with optional lane change and lane keep assist. In simple terms, this feature beeps if you are drifting out of your lane AND adjusts your steering wheel to keep you in your lane. This takes some getting used to! As long as you have a turn signal on, it will not adjust. Busy parents know the kind of fatigue they face daily, sometimes – so this is a great way to add another layer of safety to your car. You know how you often crane your head to see if there are any cars in your blind spot? Hitting a car while merging is the cause of many accidents. 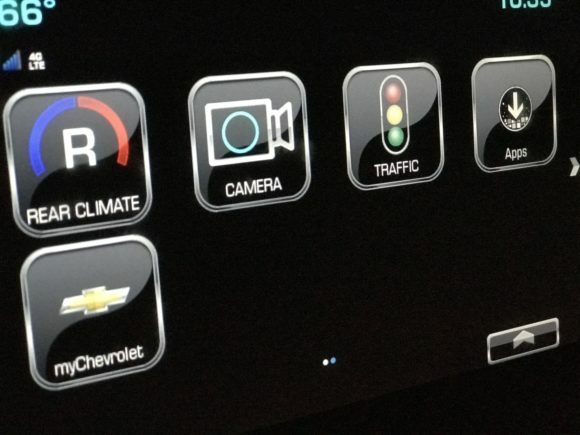 I LOVE that the Traverse comes with the option of getting blind spot monitoring! 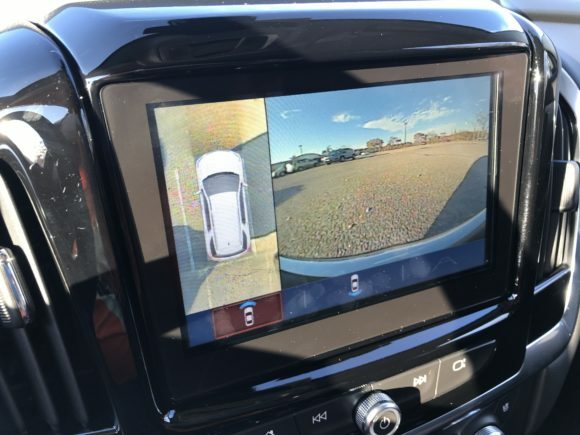 Basically, there is a sensor in the rear bumper of a vehicle that picks up on cars in your blind spot. It alerts you of the car by a lighting up a spot in your side mirror! How cool, right? Did you know that most cars come with a child safety lock? The Traverse is no exception and it’s essential for anyone with the little tots. Engaging this feature blocks the child from being able to open the door from the inside – which is a huge safety risk. A friend of mine recently described how her toddler repeatedly yanked the door handle while riding around town one day. Even with the lock it’s a little nerve-wracking! The key to this feature working as intended is that you must turn it on! It’s generally located on the side of the door that you are looking to child proof – you just move it to the on position and that’s it. 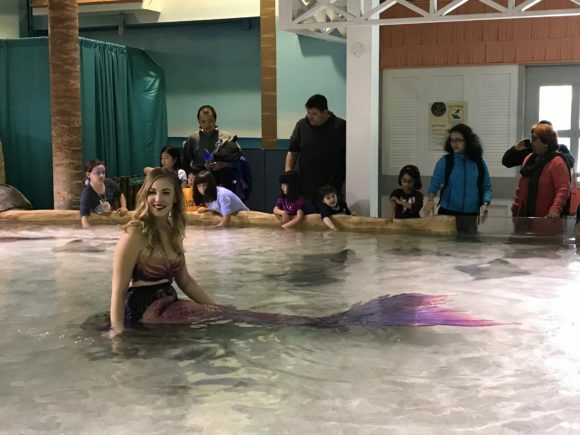 The Auers took a trip to see the mermaids at the Adventure Aquarium last fall. Photo Credit Jennifer Auer, Jersey Family Fun. 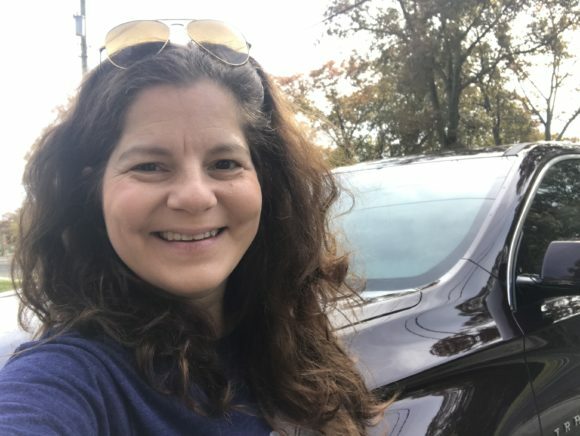 While this isn’t an exhaustive review of the Chevy Traverse, these particular features caught my eye, and after hearing about it from Jennifer it’s on my to drive list. This SUV is roomy with 3 rows of seating coming standard, and lots of valuable safety features in both the high tech and classic categories. This is definitely a great option for the price! Stop by any Chevy dealership and test drive it for yourself. 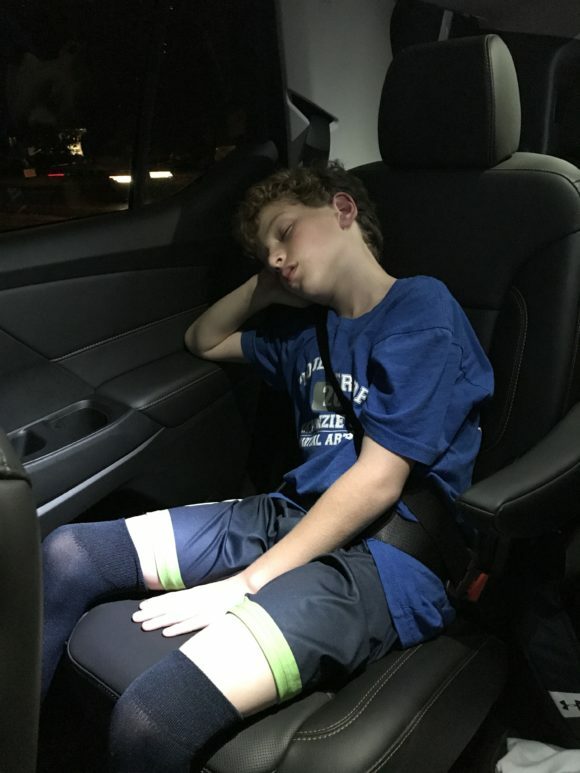 “It was so hard to say goodbye at the end of my Chevy Traverse test drive. 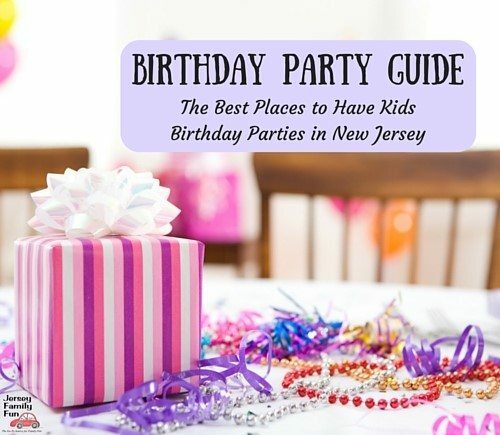 I will definitely miss these safety features,” says Jennifer Auer of Jersey Family Fun. Click over to read about more of the best family cars Jenn has taken for test drives.